INSEL is a Venezuelan enterprise managed by young professionals dedicated to the Electrical Engineering field, where, with the use of owned developed local technology, has supplied high quality products, with a built-in flexibility and international standards, to meet the markets needs. Used on fusion tests -in actual time- to verify response curves and mechanical stress. 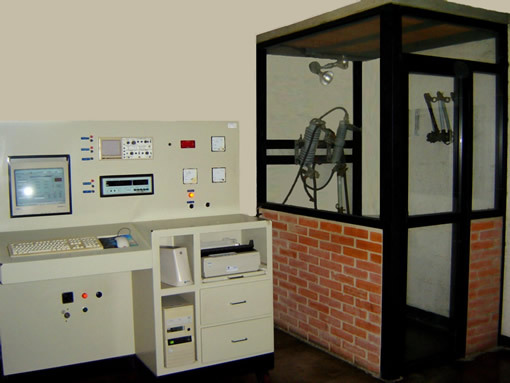 Used for temperature testing on nominal design values of fuse components. The quality assurance system uses the Statistical Control Process in all product lines, performing dimensional control maps of all products� components and in the final assembly. When performing the fusion tests, the values applied to confirm the points of 300, 10 and .1 seconds are those established in International Norms in both the maximum and minimum curves. This process is controlled by computerized systems, thus eliminating the human error factor as to assure a logical coincidence between optimal projected quality and the real one. Additional testing of temperature and mechanical stress is performed at key fuse link spots -such as buttonhead and ferrule- to confirm its functionality under a load current rating. Based on the different range designs the ANSI, IEEE and NEMA International Norms apply. By placing conductors in accordance with its range and applying maximum compression and torque. By applying to the connectors current values as specified in the Norms, to observe its thermal behavior. Oficina de Venta, Administración y Planta de Procesamiento.